Concerned about chassis shortages on the East Coast? You’re not alone. Many of our customers are setting plans in place to be sure that they’re ready to handle larger shipments following the first to pass under the Bayonne Bridge on June 26th. When we speak with our customers, we’re glad to be able to tell them things will be business as usual. Milestone Chassis is very much so present on the East Coast and poised to seamlessly assist customers with our modern fleet. As highlighted in a recent JOC article by Hugh Morley, Doug Hoehn, EVP of Milestone Chassis Co., offered assurance. In addition to our own chassis offering, he confirms that we are indeed interested in joining either the Flexi-Van/DCLI or Metro Pool. Milestone’s goal remains to offer a new, modern alternative to the aging equipment that competitors are offering. JOC subscribers can read the full article here. Be sure to sign up to reserve your chassis in advance of this development here. Here at Milestone Chassis, we strive to keep customers informed. It is particularly important now, in our changing business climate. In a recent article, the Hellenic Shipping News detailed what they and others have described as “The Big Bang of 2017,” referencing the merger of several of the largest ocean carriers. *The full article is available here. In short there are many ways to combat congestion and delay – not least of which is Milestone’s commitment to adding more new chassis and intermodal equipment into the pools in markets like Los Angeles and Long Beach. Sign up to receive daily West Coast Inventory Alerts from Milestone Chassis to keep your business moving! In an article last week, JOC flagged “warning signals” mounting at LA-LB terminals during the current, post-Chinese New Year decrease in imports. Discontinuing storage at marine terminals. Offering storage of chassis at designated yards throughout the harbor area. On-site pre-inspections and repairs, where necessary. *The full article is available to JOC subscribers here. In short there are many ways to combat congestion and delay – not least of which is Milestone’s commitment to adding more new chassis and intermodal equipment into the pools in these markets. Sign up to receive daily West Coast Inventory Alerts from Milestone Chassis to keep your business moving! 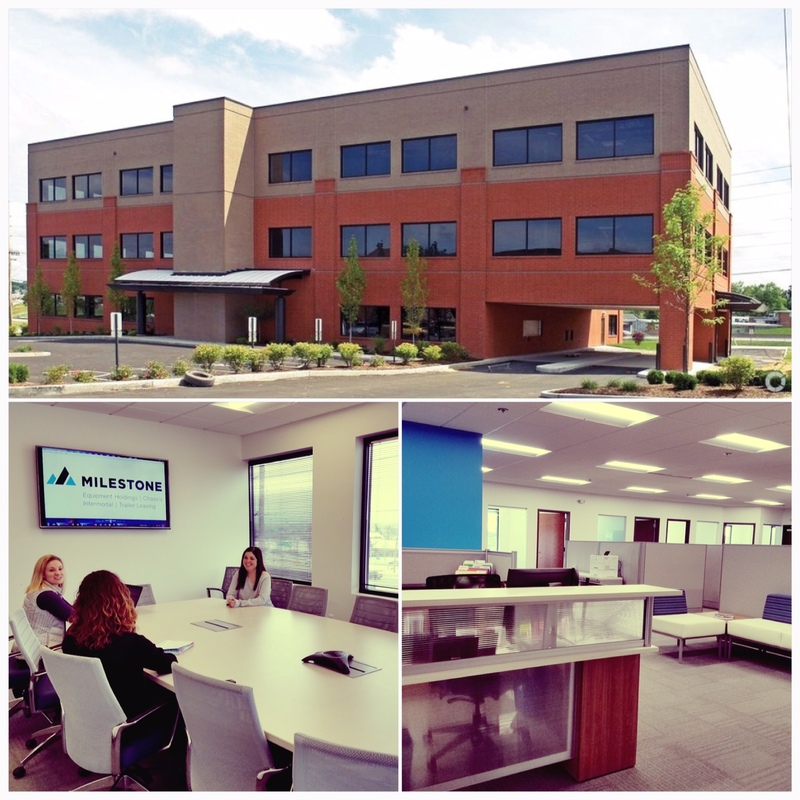 In an ongoing effort to support its growing customer base and in response to a remarkable growth year, Milestone Equipment Holdings, one of the nation’s most comprehensive lessors of transportation equipment, announces its new corporate headquarters in St. Charles, MO, near Interstate 70 and Zumbehl Road. The new facility will serve as a support hub for the company’s divisional offices in Chicago, IL (Intermodal and Chassis) and St. Charles, MO (Trailer Leasing), and its nationwide branch and depot network. This location will house the majority of the company’s administrative functions such as Finance, Accounting, Risk Management and Human Resources. Since its founding in 1995, Milestone continues to build on superior customer service and flexible solutions. Today, with a combined fleet of over 84,000 domestic chassis, containers and trailers, the company continues to offer customers full service transportation equipment leasing and asset management. The electronic logging device (ELD) rule is intended to help create a safer work environment for drivers, and make it easier, faster to accurately track, manage, and share records of duty status (RODS) data. For carriers using AOBRDs (automatic onboard recording devices) before the rule compliance date December 18, 2017, the rule will replace AOBRDs with ELDs over a four-year implementation period. An ELD synchronizes with a vehicle engine to automatically record driving time, for easier, more accurate hours of service (HOS) recording. The rule applies to most carriers and drivers who are required to maintain RODS. Specifies who is covered by the rule and exceptions to it. Provides for ELDS to be certified, registered, and listed on a FMCSA website. Includes technical specifications to ensure ELDs are standardized and compliant. Includes a phased implementation timeline to give drivers and carriers time to comply. Includes provisions to help prevent data tampering and harassment of drivers. Creates standard data displays and data transfer processes, making it easier to demonstrate compliance and faster to share RODS with safety officials. Carriers and drivers who are using paper logs or logging software must transition to ELDs no later than December 18, 2017. Carriers and drivers who use AOBRDS prior to the compliance date must transition to ELDs no later than December 16, 2019. Enforcement Partners must understand enforcement and compliance procedures during each implementation phase, and which regulatory guidance applies to each. ELD Manufacturers must conform to ELD technical specifications, certify their ELDs, and register them with FMCSA. The ELD Rule applies to most motor carriers and drivers who are currently required to maintain records of duty status (RODS). The rule applies to commercial buses as well as trucks. Canada- and Mexico-domiciled drivers are included, unless they qualify for one of the exceptions to the ELD rule. Drivers who use paper logs no more than 8 days during any 30-day period. Driveaway-towaway drivers (transporting an empty vehicle for sale, lease, or repair). Carriers must evaluate and select ELDs, and ensure they are installed and drivers and administrative staff are trained to use them by the deadline that applies (December 16, 2019 for carriers using AOBRDs or December 18, 2017) for those using paper logs or logging software. The Compliance Checklist for Carriers includes additional information. Drivers must understand and be able to use ELDs by the required deadline, including how to annotate and edit RODS, certify RODS, and collect required supporting documents. You will also need to know how to display and transfer data to safety officials when requested. The Compliance Checklist for Drivers and the Using ELDs section provide more details. ELDs make it easier, simpler, and quicker to keep driver logs. ELDs limit mistakes and reduce form and manner errors. ELDs provide information to drivers and motor carriers so that drivers can better manage fatigue and schedule issues. ELDs correctly record location and accurate information to easily track duty status. ELDs are a good management tool and back office asset to improve productivity and enhance compliance. With ELDs, there is less paperwork, and driver logs are orderly, clear, and accurate. Below are tips to consider when choosing an ELD, and a checklist of key features and functions that every ELD must provide. Most Important: Make sure that the specific ELD model you are considering is on FMCSA’s list of registered ELDs. Review the list of registered ELDs here. The vendors on this list have self-certified that their device is compliant with all of the ELD technical specifications, and registered each ELD model with FMCSA. Take a few minutes to research the ELD provider by checking with the Better Business Bureau and looking at online reviews for their products and customer service. While many ELDs may be part of a Fleet Management System (FMS) or include FMS functions, there is no requirement for Fleet Management functionality. An ELD that complies with FMCSA requirements is what is required by the ELD rule. Before choosing an ELD, have the vendor verify that its device meets all of the ELD specifications contained in the rule. While this list is not a complete list of all required ELD functions, at a minimum have the vendor demonstrate or show you all the features and functions in the list below. Note: The information provided on this website is to help promote understanding of and compliance with the ELD rule – it is not a substitute for the specific requirements documented in the rule. Milestone provides personalized service in trailer leasing and rentals to our customers – every day, all year long. We are committed to supporting our clients in the form of open-architected arrangements, flexible options and added-value services. We have a complete range of equipment to fit any application including factory direct new 2017s, mid-range model years for economical over-the-road use, and well-maintained older units for cartage and storage use. In addition, we have a large quantity of 53’ air ride trailers that are 2012s-2013s available for rental and lease at competitive rates. For short-term needs, seasonal/peak demands, rental may best suit your needs. With no minimum term, this selection will allow you to utilize the equipment in new lanes or pools as you determine the long-term need. In addition, our rentals are billed on 12 calendar months, not 4-week cycles, which results in 13 bills over the course of a year from some leasing companies. We provide competitive priced equipment for storage, cartage and over-the-road needs. Entering into a lease is the most cost-effective way to supply steady business pools and lanes. This allows for competitive monthly rate, not subject to rate increases during the lease term, and ensures you have the right asset when you need it. As a lease customer, you also gain priority status if and when you need to rent trailers on a temporary basis. Looking to buy trailers? Give us a call for current inventory. Looking to sell trailers? Give us a call with your current inventory. As an example of our capabilities, we may be able to arrange a purchase of your fleet, then lease it back to you until you either purchase or lease replacement trailers, or arrive at the end of their utility in your operation. We have both the resources and the creativity to consider solving any problem you may have with respect to trailers. Milestone partners with a variety of satellite tracking (GPS) services to provide the platform that best suits your needs, meaning you do not have to accept whatever system we happen to be offering. Tracking is available on both rental and lease equipment. We take care to ensure the customers can access the internet portal to provide accessibility to tracking. There is no additional fee for tracking, it is included in your monthly rental or lease rate. For more information, contact your local Milestone location for availability and pricing. In the spirit of giving back, Milestone Intermodal has recently donated a 53-foot steel container to the Keller Central High School Band in Keller, Texas to help students keep their equipment and props safe and secure, season after season. “We have been talking about how to reach out and support our communities and for me, both personally and as a senior manager at Milestone, this is exactly what we need to do and where we need to give back,” says Amy Genobles, President of Milestone Intermodal. Looking for a solution to their storage situation, Keller Central High School’s Band Booster Association estimated program costs of $1,800 to $3,500 for off-site storage container options for students’ equipment and props. “[Milestone’s] generosity allows us to use the money we would have spent replacing damaged equipment or paying the cost of other storage options and allows us to invest more in the training, education and needs of our students,” says Gina C. Root, Keller Central High School Band Booster Association Vice President. The donated container is currently being converted for use as a storage unit. The finished product and photos to come! This year marked a true “milestone.” For the Intermodal Association of North America, the celebration of their 25th Expo. For our organization, the launch of the Milestone Chassis division and its modernized chassis program. Recently we celebrated both in Houston at the 2016 IANA EXPO. It was a pleasure to celebrate both events with so many friends throughout the industry. In addition to meeting with current and prospective customers in our booth over coffee while one of our new chassis was on view , we had the chance to demo ChassisFinder.com (now part of the Milestone portfolio) and highlight the chassis inventory in our expanded equipment fleet. Our own Jordan Ayers was included on the panel “OTR Capacity Shortages – Will the Predictions Come True?” Since there have not been any OTR capacity shortages this year the panel moderator, Larry Gross had the panel address other intermodal industry shortages, like chassis. Ayers commented on the surge in chassis bookings due to Hanjin Shipping’s recent bankruptcy. He noted the inability to return Hanjin containers to the terminal operators, railroads, and Hanjin’s depots as a key factor in causing the current chassis shortage. Many motor carriers are being forced to store mounted Hanjin containers on chassis for extended periods. 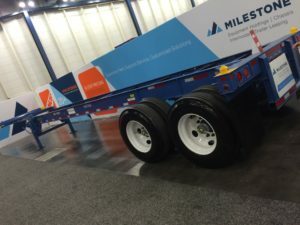 Milestone has quickly responded by delivering more new chassis to the effected markets, living up to their customer-centric reputation. This has been, and will continue to be a period of growth for our company, as we innovate and provide chassis solutions to meet customer needs. We look forward to introducing Milestone Chassis to all of our Intermodal partners throughout North America! In response to the Hanjin Shipping bankruptcy, Milestone continues to offer an expansive fleet to minimize disruption for customers. Please find the latest news regarding this matter below. The bankruptcy of Korea’s Hanjin Shipping Co Ltd (117930.KS) is causing ripple effects for importers bringing goods from Asian factories to U.S. malls by creating a shortage of trailers to move ocean-shipping containers on U.S. roads. The world’s seventh-largest container carrier has more than 500,000 containers, and many already are clogging up ports and truck yards, tying up trailers that cannot be used to handle other cargo. That is beginning to worry freight handlers at U.S. West Coast ports and is the first sign of knock-on effects from the failure of Hanjin. The problem stems from Hanjin’s shortage of cash, which has stranded $14 billion of cargo owned by companies such as HP Inc (HPQ.N), Home Shopping Network (HSNI.O) and Samsung Electronics Co Ltd (005930.KS). Much of the cargo is on more than 100 ships at sea because cargo handlers, tug operators and ports are refusing to work with Hanjin unless they get paid up front. A lawyer for the shipper did not immediately respond to a request for comment. Terminal operators in the California ports of Long Beach and Oakland are not taking back empty containers. Many in the industry doubt Hanjin will pay storage costs, and a growing number of empty containers and the trailers they sit on are stranded. “If it’s not fixed in the next couple of weeks, I think you’ll see a huge ripple effect across the industry,” said Weston LaBar, executive director for the Harbor Trucking Association in Long Beach, California. LaBar said there are thousands of Hanjin containers on trailers out of circulation, and the uncertainty surrounding Hanjin appears to be pushing truckers to lock in trailers from his organization’s pool. Shipping executives said there is ample supply of shipping containers, but trailers are limited. The West Coast ports previously have experienced brief shortages even when the stream of trade is functioning normally. The Hanjin collapse has exacerbated the problem. Read the full article here or request a quote here. ST. CHARLES, MO (September 12, 2016) – Milestone announces the addition of Don Clayton who joins the team as Executive Vice President and Chief Financial Officer. Clayton will be based in St. Charles, MO and will report directly to Jordan Ayers, President and Chief Operating Officer. Clayton has 18 years of experience working in the industrial distribution and financial services industries, including eight years as Chief Financial Officer of a multi-billion-dollar nationwide distributor and seven years in the financial services audit practice at PricewaterhouseCoopers. He has extensive experience in strategic planning, financial reporting and internal controls. He has also played key roles on several acquisitions and capital market transactions. Clayton received his Bachelor of Science in Business Administration with an emphasis in Accounting from Southeast Missouri State University. He is a Certified Public Accountant.